According to the American Association of Oral and Maxillofacial Surgeons, 70 percent of adults have lost at least one permanent tooth. More than 25 percent of adults over the age of 60 have lost all of their permanent teeth . If you’re missing teeth, you understand how difficult it can make your life. Actions that used to be simple such as chewing, speaking and smiling can become tedious and difficult. The good news is that, in many cases, dental implants are the best option for replacing your missing or extracted teeth. They are sturdy, reliable, and look just like natural teeth. With proper care, they will last for many years. Dr. Olga Malkin and the team at Tribeca Advanced Dentistry are highly trained in dental implant dentistry. Dental implants require specific skills and training along with the latest dental technology, which is why our procedures are done by Prosthodontist Dr. Malkin and Periodontist Dr. Moldovan, utilizing state-of-the-art 3D dental scan for more challenging cases. While there is no official recognized dental specialty for implant placement and many General Dental practices in Manhattan place dental implants, Prosthodontists, Periodontists and Oral Surgeons have additional expertise which allow to achieve higher success rates in implant placements. Journal of American Dental Association published a study concluding that “survival and success rates in general dental practices may be lower than those reported in studies conducted in academic or specialty settings”. 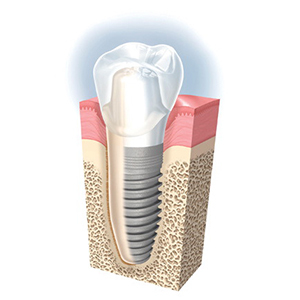 Dental implants are essentially comprised of titanium posts. These posts are surgically implanted in the jawbone beneath missing or extracted teeth. These posts support several variations of tooth restorations including single crowns, dental bridges, or a set of dentures. Although there are a large variety of implant systems available, our practice prefers to use Nobel Biocare implants as they are the leader in implant dentistry with three decades of follow-up studies on their implants. Their technology is second to none and their computer-generated implant bridges, abutments, and crowns are known for their incredibly natural look and excellent fit. Most implant placement processes take three steps. The first step involves placing the post in the jawbone during an oral surgery. Once this area fully heals and the post has integrated with the jawbone ensuring stability, we install the false tooth in the form of a single crown, bridge, or set of dentures. These are screwed onto the top of the implant post. The end result is a natural-looking implant that feels almost like a natural tooth. In the case of a single tooth replacement, a crown is used. This procedure doesn’t involve prepping any of the surrounding teeth. While you are healing from the post surgery, a temporary crown will be put in place. After three to six months, your permanent crown will be placed. In cases where multiple teeth need to be replaced, we will use single implants, an implant bridge, or a set of dentures depending on the situation. The process is similar to a single tooth replacement. However, prosthetics will be used to restore normal appearance and function to the teeth. To replace all of the teeth on either the top or bottom, a minimum of four implants (ten max) can be placed according to the design of the final bridge. The bridge’s final design is made after thorough examination of the patient’s condition as well as the patient’s desires, treatment goals, and budget. The immediate implant bridge procedure allows patients to restore function and aesthetics right away and takes less time to heal than if the patient were to wear removable dentures. The speciesist team of Tribeca Advanced Dentistry has been focusing on “immediate load” procedures since 2007. You can watch an “immediate load” dental procedure video below or read more information about “Teeth-in-a-day” and “All-on-4” dental implant procedure.